Ya Jagoff!!! | Who Put All Of the Pins In This Shirt? Home Inanimate Jagoffs Who Put All Of the Pins In This Shirt? Who Put All Of the Pins In This Shirt? So, I bought some dress shirts the other day. And, thankfully I am not on blood thinners. Not only did I have to pull off all of the stickers, plastic collar button butterfly thingies, cardboard-under-the-collar hicky-ma-jigs but, I had to go on a “straight pin” exploration! The thing is full of them and, if you happen to put the shirt one, or, even worse tuck it in near your groin area, without finding all of the pins, there’s a pricking surprise. Do we really need this many secretly placed straight pins to keep this shirt looking it’s best in the package? Can we not just fold them nicely and stack a 100 of them on top of each other which would nicely press the ones on the bottom? I mean, I have 4 dresser drawers stuffed tight with all of my free t-shirts and, the ones on the bottom of the drawer, look like they’ve been impeccably pressed at a dray cleaner with heavy starch! Could we at least get a check list or a tag on the inside telling us where to find the pins or how many pins I might have to dive in and find? Here’s the other thing, there AIN’T no machine that puts these pins in place. I’m thinking the shirt could be discounted by 50% if they saved the cost of the pins and putting them in. 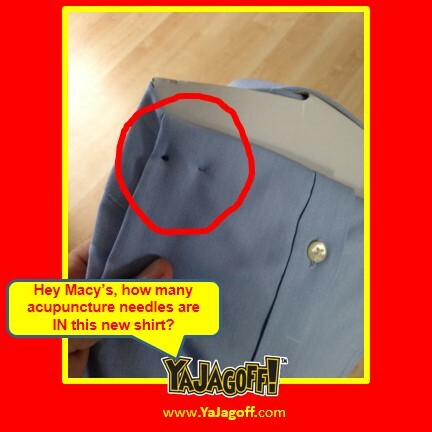 Hey Macy’s, I didn’t think that I bought an acupuncture vest! Thanks for making me go to my garage, weed through all of the inflatable rafts, skim boards, 12-year old snorkel masks and unused goggles to dig out my once-a-year-Myrtle-Beach-Outer-Banks metal detector to scan my new shirt before I could wear it, Ya Jagoffs! Previous articleWanna Have Beers With Bryan Trottier?? The Jagoff Peanut Butter Jars!! !